21st of July was a time when we bade farewell to Mr. Detlef as he prepares for his next milestone in life – Retirement. Mr Detlef has been with SHAS for 16 years! His iron forearms and iron legs are testament to his years of training in and out the dojang. The farewell party was held at the Jungle Bar in The Swiss Club. It was wonderful to be in the company of members, past and present, come together outside of dojang, and spend a beautiful Saturday evening enjoying the food and conversations. As the night came to an end, Master Sng presented Mr. Detlef with a farewell gift prepared by Ms. Angie and members of SHAS. As Mr. Detlef prepares for his departure, we wish him all the best in his future endeavours, and look forward to him visit us in the near future! 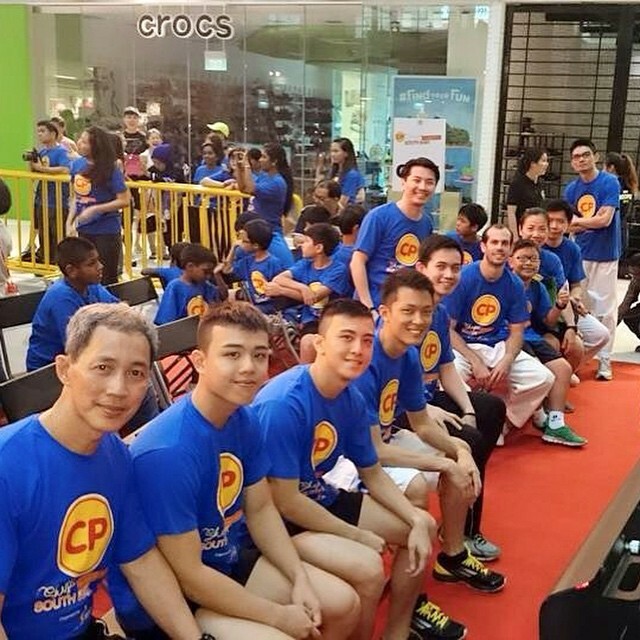 On the 23rd of May 2015, members of both Island Taekwon-Do Centre and Sun Hapkido Academy Singapore participated in the 2015 edition of “CP Skips For Good Food”, held at OneKM Shopping Mall Atrium, from 9:30am to 9:30pm. The event is a community campaign organised by South East Community Development Council (CDC) and sponsored by CP Foods to raise and provide food assistance for the needy living in the South East District. CP Foods has pledged to donate $90,000 worth of food hampers to this campaign collaboration that aims to garner five million skips. The event consists of two different categories, one being where a large group of people skipping together to contribute to a combined number of skips, whereas the other group will be attempting to break the ‘most number of skips by an individual in a continuous 12 hours relay’ which formerly stood at 35,000 skips according to the Singapore Book Of Records. Although the event started at 9.30am, several members of ITC and SHAS were at OneKM mall by 9.00am so as not to miss out on the opening ceremony, where the Guest Of Honour, Dr. Mohamad Maliki Osman, Mayor of South East District, made a short speech. As the buzzer to start the event sounded, Dr. Mohamad Maliki Osman and his entourage were already busy skipping away. Away from where most of us were skipping, there was another group skipping furiously away as they were the ones trying to break the Singapore record for most number of skips by an individual in a continuous 12 hours relay. Mr. Jeremy Tan, member of ITC and SHAS was part of the latter group. The group skipping was done in different rows of five which would continuously rotate every 5 minutes, while those trying to break the individual record would continuously skip for an hour before allowing themselves a few moments of rest. Towards the later half of the skipping event, fatigue started to set in, but instead of giving up, Jeremy Sir persevered on in the name of charity and did not even think about trying to break the record anymore. He thought about trying to get more skips so as to be able to help those people in need more. Towards the end, the Guest Of Honour, Dr. Mohamad Maliki Osman gave a short speech and awarded medals to the participants who had tirelessly skipped for 12 continuous hours. Overall, it is certainly heart-warming to see that many people are willing to sacrifice their time and effort to help those in need, and I am glad that ITC & SHAS had given me a chance to participate in this event.